The Evolution G2 Series is the latest addition to Sennheiser’s Evolution family of wireless microphones. 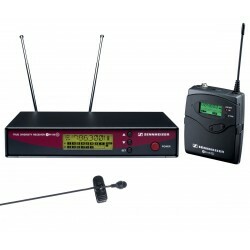 The UHF wireless microphone system features 1440 tunable frequencies and 4 frequency presets. This system includes the EM100G2 camera mountable receiver, SK100G2 body-pack transmitter and ME4 cardioid lavalier microphone. The EW100G2 receiver is made of a durable metal enclosure and features a full functional LED display. The receiver features a 1/8″ unbalanced TRS mini output for quick connection to camcorders. The receiver features 4 preset memory locations that can be reassigned to any of the 1,440 available frequencies, within the 32MHz tuning range. The SK100G2 body-pack transmitter features an identically designed enclosure as the receiver. It also features an LCD display and 4 preset memory locations that can be reassigned to any of the available 1,440 frequencies. The transmitter features an 1/8″ locking-mini input for compatible lavalier microphones.